Today the OSU basketball team won their first game of the season against a ranked opponent, beating Indiana 82-70. It’s a nice win, but it sure took a while to get it — a lot longer than we’ve come to expect during the Ohio State career of Coach Thad Matta. This year’s Buckeyes squad has had a scrappy journey so far. The Buckeyes have three key seniors — Sam Thompson, Shannon Scott, and Amir Williams — and many fans have been disappointed in their play. Williams, in particular, has been hard to figure out; he’s got the size, but seems to lack the competitive fire that has characterized some of Coach Matta’s other products, like David Lighty and Aaron Craft. It is noteworthy, perhaps, that today’s win came in a game where Williams did not play at all. Coach Matta is trying to mix the seniors in with some stellar freshman that include D’Angelo Russell and Jae’Sean Tate, who led the Buckeyes in scoring today, redshirt freshman Kam Williams, and sophomore Marc Loving. It’s fair to say that the Buckeyes are a work in progress, and the gears don’t really seem to be meshing yet. Trying to make the pieces fit and motivate the players who don’t seem to be giving it their all, and win a few more key games in the process, will be one of Coach Matta’s toughest assignments. The Buckeyes’ next game, against a pretty good Maryland team, will tell us a lot about whether today’s result was a fluke — or maybe the start of something better. We’ll see whether Coach Matta can pull another rabbit out of a hat. Tonight Kish and I will be heading to the Ohio State-Marquette game as the guests of two of our generous friends. It will be my first chance to watch an Ohio State basketball team that will feature a dramatically new look. For the first time in four years, the Buckeyes’ roster won’t include Aaron Craft and Lenzelle Smith, Jr. (No Aaron Craft! No Lenzelle Smith! Sniff!) Those two players were mainstays of a series of Ohio State teams that won Big Ten championships, Big Ten Tournaments, and compiled a pretty good NCAA Tournament record. Now they are gone, and there are some new faces. We’ll still have Slammin’ Sam Thompson at forward and steady Shannon Scott at the point, and Amir Williams and Trey McDonald will patrol the paint, but the identity of last year’s team was mostly set by Craft and Smith. Now the Buckeyes will have to find a new identity — and given last year’s shooting woes, that might not be a bad thing. This new-look Buckeyes team seems to have a lot of talent, but it’s raw. There’s a lot of buzz about a group of freshmen that includes D’Angelo Russell, a guard who is rumored to be the lights-out outside shooter we’ve been waiting for since Jon Diebler graduated, guard Kam Williams, and forwards Keita Bates-Diop and Jae’Sean Tate, as well as Anthony Lee, a power forward who transferred from Temple. I’m also interested in seeing how Marc Loving, a sophomore who played well at the beginning of last season but seemed to hit the freshman wall, has developed over the past year. It’s hard to draw too many conclusions from the Buckeyes’ first game, when they smeared UMass-Lowell, but in that contest the Buckeyes played ten-deep and pressed for much of the game. Whether Ohio State plays the press against a Big East team like Marquette tonight — to say nothing of the non-conference games against perennial powers Louisville and North Carolina that are coming up — remains to be seen. For now, we’re just trying to get to know this team and hoping that they fill the hole left by the departure of two fan favorites. 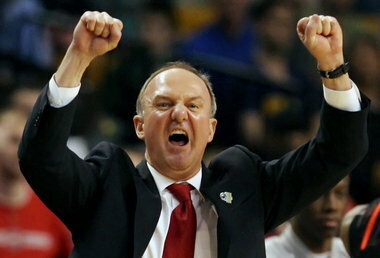 I’m guessing, though, that Thad Matta thinks he’s got something here. Sociological theory holds that every successful organization needs “glue guys.” Coaches of sports teams agree. “Glue guys” are the people who do the little things that don’t necessarily show up on the stat sheet, or the balance sheet, but that are crucial to moving the overall endeavor in the right direction. On a basketball team they take the charge, dive for the loose ball, and cheer like crazy for the team when they are on the bench. In an office, they might bring in a dozen doughnuts for no reason, take the new guy in accounting to lunch during his first week, or try to smooth ruffled feelings so a minor incident doesn’t become a major blow-up. The “glue guys” typically aren’t perceived as superstars, and often their contribution is just assumed. But if the “glue guys” leave, suddenly the office or the the offense doesn’t run quite so well, the prima donnas start battling for attention, and bad feelings start to grow. Before you know it, people are hogging the ball and communicating with each other through passive-aggressive notes stuck to the front of the office microwave. When I reflect on our dysfunctional political environment, I wonder if the real problem is that we lacki those political “glue guys” — the Senators and Representatives who, in the past, could swallow their pride, work with people in the other party, keep their word, and forge a fair compromise that would allow the necessary work to get done. Now, it seems, everyone acts like a superstar — they raise huge amounts of money, they send countless overwrought e-mails soliciting even more cash by presenting opposing views in the most dangerous possible light, and when the party talking points get circulated they dutifully go on MSNBC or Fox shows and say pointed, terrible things about the other side. How many of these preening politicos would take a charge or dive for a loose ball to try to, say, develop a rational approach to immigration issues? I think we need more of the “glue guys” in Washington, D.C. The question is, how do we accomplish that in our modern polarized, money-saturated, poll-driven political system? I had a busy day at work today, with a series of meetings and conference calls. I was so focused on work matters that I didn’t watch a second of the Ohio State-Dayton NCAA Tournament game, or even follow it on my cell phone or computer. That’s a good thing, because the Buckeyes lost a heartbreaker, 60-59, on a last-second shot. I’m sorry that the Buckeyes lost, of course, but the fact that I didn’t watch the game and agonize over every turnover, missed layup, and defensive breakdown meant that I avoided most of the awful fan-pain that I would have endured otherwise. Instead of feeling like someone had kicked my guts in when Dayton made the winning shot and the Ohio State careers of Aaron Craft and Lenzelle Smith Jr. came to an end, the game was sort of like something that happened in an alternative universe — a bit more abstract, and a little less real. When March Madness rolls around, employers question how much work their bracket-obsessed employees are really doing on Thursday and Friday. I would suggest that employers take the bull by the horns, recognize the predominance of NCAA pooling, and encourage their employees to schedule lots of meetings and events that will occupy their time and their minds when weekday games are on. Distract yourself, and don’t risk the terrible, real-time suffering! The employees can always record the games of their favorite team, as I did. If you learn that your team won its game, you can go home, crack upon a frosty beverage, and enjoy their game at your leisure. If you learn that your team has fallen, you can shake your head sadly and quietly erase the debacle without watching a second of the recording. It’s not a bad approach for the ardent sports fan. The Ohio State Buckeyes played a good game today but lost to the Michigan Wolverines, 72-69. The loss knocked the Buckeyes out of the Big Ten Tournament and kept them out of the championship game, where Ohio State has made a home for years. No loss is ever a good loss — particularly when it’s against that unholy Team Up North — but this game had some redeeming qualities. Once again Ohio State fell far behind, but once again it came back, and against a darned good team. The Buckeyes stayed with Michigan even though the Wolverines shot lights out, and they held down the high-flying Michigan offense for long stretches of the game. In the end, it came down to some missed free throws, an offensive rebound that went Michigan’s way, and a ball that slipped out of Aaron Craft’s hand. There were lots of positives in this game. OSU guard Shannon Scott was tremendous — hitting little stop and pop jumpers, bombing in treys, making some great passes, and playing tough defense. Scott looked every inch the five-star recruit he was when he first came to the Buckeyes. If he’s found his rhythm offensively, he’ll be the perfect complement to LaQuinton Ross, who played another strong game inside. The Buckeyes got decent production from a range of players, and they’ll also get an extra day’s rest after playing three tough games in three days. Now it’s on to the Big Dance. Most people are saying the Buckeyes will be a five seed; I’m guessing a six. At this point, it doesn’t much matter – you need to win every game, or you go home. During the Big Ten Tournament, the Buckeyes showed a lot of toughness and will, and those are qualities that should serve them well in the days ahead. If the Buckeyes play offense during the NCAA Tournament like they did today, and manage not to run into a team that shoots better than 50 percent from behind the arc, they may be dancing past the first weekend. Those of us in Buckeye Nation would happily accept that result. Because I can’t use my left foot or get exercise in the conventional way, I’m trying to get my blood pumping by watching the Ohio State basketball team. So far, my plan is working like a charm. Today the Buckeyes played Nebraska in the quarterfinals of the Big Ten Tournament. Ohio State stunk up the joint at the end of the first half and the beginning of the second and were getting embarrassed, 48-30. My blood pressure was spiking at the pitiful performance, with flushed cheeks and spittle and epithets flying. But then, improbably, a mop-topped bean pole spurred the Buckeyes. With Amedeo Della Valle hustling his brains out, and LaQuinton Ross making just about every shot he put up, and Aaron Craft playing the tough D that is his trademark, the Buckeyes came back to win, 71-67. That’s a 41-19 run to close out the game — and it was fitting that Della Valle iced the victory by coolly making four free throws with the game on the line. How do you explain this team? They disappear, then come roaring back. They can’t make a free throw for most of the game, but as the clock winds down they can’t miss. They seem to lose their composure, but as the game ends it’s the other team that is red-faced and stunned. So, the Buckeyes move on. Tomorrow they play Michigan. The Buckeyes had better bring their A game for all 40 minutes tomorrow, because if they fall behind the Wolverines by 18 there’s no coming back. Aaron Craft and Lenzelle Smith, Jr. played their last home game today. They’re seniors who’ve been among the winningest basketball Buckeyes of all time. In their first three seasons, they’ve made it to three Sweet Sixteens, one Elite Eight, and one Final Four. This year, though, has been a struggle. The Buckeyes started 15-0, then hit the wall during the Big Ten season. Going into today’s game, the Buckeyes were 9-8 in the Big Ten and had lost two in a row to Penn State and Indiana, two of the conference’s worst teams. For the first time in years, Ohio State has been painful to watch on offense. They’re jittery and always seem to be out of sync and unwilling to take an open shot in the flow of the game. No one wanted to see these seniors go out on a home loss — and I’m happy to report that they didn’t. Somehow, some way, despite missing a bunch of free throws down the stretch, the Buckeyes hung on and pulled out a win over Michigan State, which is clearly one of the Big Ten’s best. As always, Lenzelle Smith, Jr. and Aaron Craft were keys. Smith led the Buckeyes in rebounding. Craft had steal after crucial steal, disrupted the Michigan State ballhandlers, and had a key dive for a loose ball that helped to nail the Spartans’ coffin shut as the seconds ticked down. Smith and Craft both played their trademark hands-on-the-floor defense at the end of the game, as the Buckeyes held the Spartans scoreless and managed to eke out just enough points to win. I don’t think this team has the offensive ability to go far in the Big Ten Tournament or the NCAA Tournament — they seem to have forgotten how to shoot free throws, among other things — but they are tough, and Smith and Craft set the toughness tone. I’ll miss these seniors, who have been so successful and who have meant so much to the Ohio State program. They have been good students, good representatives of The Ohio State University, and good people. Good luck, Aaron and Lenzelle, in whatever you do: it’s been a pleasure watching you!